I’VE HAD my break. Now back to work. 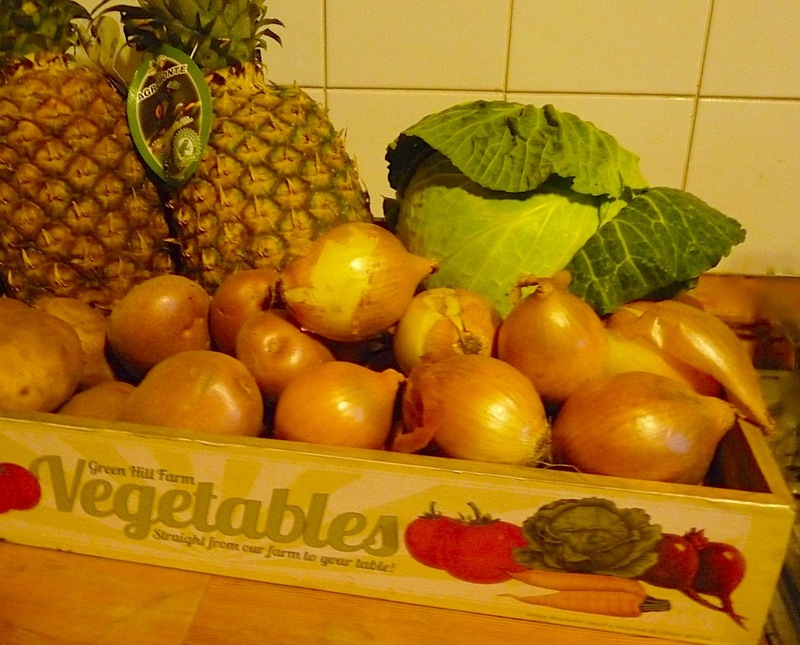 Every week I take £5 to Ridley Road Market in Dalston, Hackney, London E8 2LH, to spend on seasonal food. On Friday I tell you what I have chosen and publish a seasonal recipe. As usual, expenditure on any extra ingredients, eg, a litre of oil, will be recouped by usage over subsequent weeks. Some of the recipes will be frugal. They will all be tasty. All will be vegetarian. The Christmas holiday means a busy time in the kitchen so an easy-to-prepare dish that cooks itself and is filling is a joy. Pop the potatoes into the oven alongside mince pies, shortbread biscuits or any other Christmas treat that you’re baking, making yourself free for other jobs. Ingredients: 2 potatoes, 50g cheddar cheese, small nob of fat. I use butter. Optional extras: clove of garlic cut in half, salt, another nob of butter/fat, kitchen foil. Method: There are several ways to prepare jacket potatoes and I have listed my two favourites. Place a metal skewer through the centre of each potato. Potatos come in many sizes, of course, but it is usual for 2 potatoes to fit on one skewer. Place the potatoes in the hot oven and leave. Average-size potatoes take 40 to 50 minutes, the really big potatoes up to 2 hours. Another way with the optional extra ingredients is to rub the extra fat into the potato skins, the same with garlic halves: rub the cut side of the clove over the skin and lightly sprinkle with salt. Wrap the potatoes separately in kitchen foil with the half cloves and cook as above. When the potatoes are ready — the skins crispy and soft inside or soft to the touch if in the foil — remove the skewer or foil and cut a cross in the top of each potato. Squeeze the four corners so that the white flesh puffs out through the cross a little way. Top with butter and grated cheese. Serve with a salad. Top with baked beans, hoummos or fried onions. In my family we eat the skins. * The other items in my basket will be made into lightly steamed cabbage with butter and caraway seeds, bubble and squeak, cabbage parcels, roast or mashed potatoes. The onions will be used in some of the above. I shall peel and core the pineapples. Then you can eat them, or you can add them to a fruit salad or grill with cinnamon and serve with ice cream. * Nine Elms trade market (New Covent Garden Market), the source of most fruit and vegetables for street markets in SE England, is closed on Christmas Day, so his column was unable to visit Ridley Road market on the Wednesday for a Friday article. Likewise, for the first week of the new year. So my break extends another week.